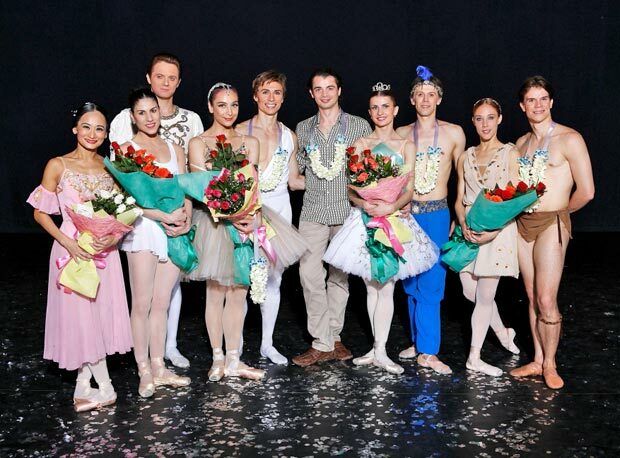 World Stars of Ballet line-up (l to r): Lisa Macuja, Paloma Herrera, Yevgeny Ivanchenko, Daria Pavlenko, Maxim Beloserkovsky, David Makhateli, Aleksandra Timofeeva, Dmitri Gruzdev, Yolanda Correa Frias and Yoel Carreno. 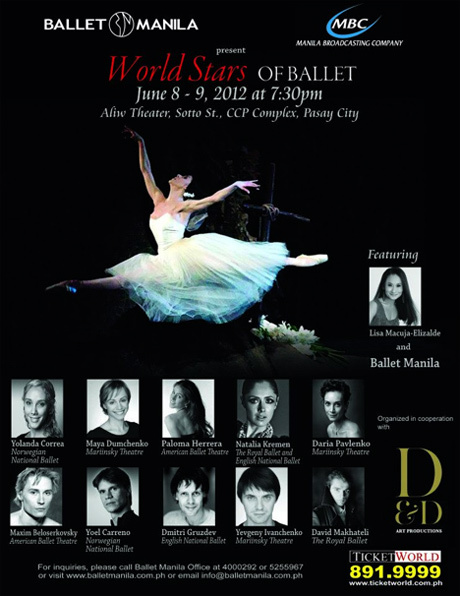 The “World Stars of Ballet” were represented by a nine-strong team of dancers selected by D&D Art Productions (which despite being the new venture of former Royal Ballet Principal, David Makhateli, and his business partner, Denis Autier, is an acronym that actually stands for “Dance & Dancers”). Their new company already represents a roster of 21 of the world’s leading dancers from the Bolshoi, Mariinsky, Paris Opéra Ballet, English National Ballet and Staatsballet Berlin. 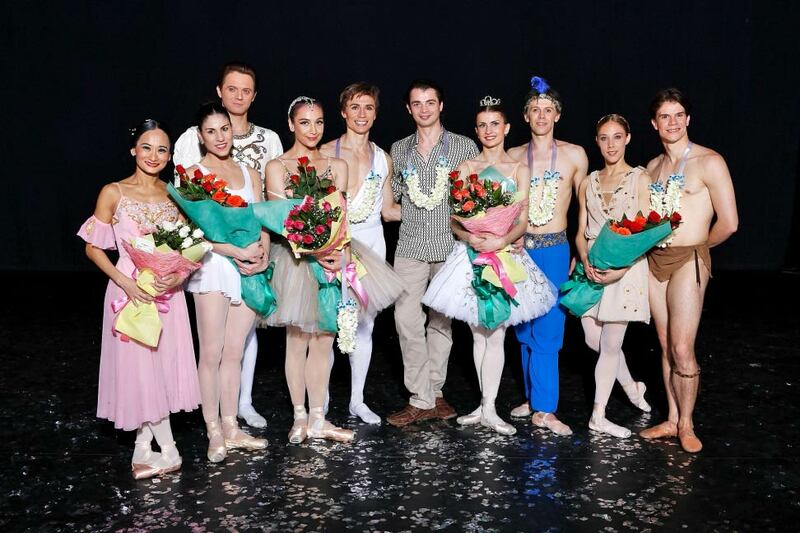 The guests came in three pairs and a pick-and-mix trio: Paloma Herrera and Maxim Beloserkovsky came from American Ballet Theatre; Daria Pavlenko and Yevgeny Ivanchenko travelled from the Mariinsky in St Petersburg; the Cuban husband and wife duo of Yoel Carreño and Yolanda Correa Frias came from Norwegian National Ballet; and Makhateli – now a guest principal at the Moscow Kremlin Ballet – shared his new dance partner, Aleksandra Timofeeva, with ENB’s Dmitri Gruzdev. Yolanda Correa Frias and Yoel Carreno in Diana and Actaeon pdd. They delivered a less predictable programme than is to be expected in normal gala fare (no Swan Lake or Sleeping Beauty extracts, for example), and their five pieces supplemented nine works danced by the home team from Ballet Manila. Far from just filling in between the “world stars”, the indigenous dancers delivered an impressive programme of their own to make this a particularly diverse event The spirit and enthusiasm of this relatively young company (just finishing its sixteenth season) is infectious, with their steely discipline firmly founded on Vaganova training that is regularly topped up by guest teachers coming from St Petersburg, and a steady flow of young dancers emerging through the company’s own school. The strength of this commitment is underlined by their Project Ballet Futures, which awards scholarships to young people literally coming from the streets of Manila, in aid of which this gala was arranged. Generous sponsorship of the cost of the event by the Manila Broadcasting Company enhanced the contribution that could be made to this very worthy cause. The quality of the company’s training was underlined by two pairs of teenage dancers who performed the classical and modern routines they were to air again in the Beijing International Competition, held a few days after this gala. Both couples danced the 2nd Act pas de deux from Giselle, in alternate programmes, giving strong accounts of this familiar choreography. Joan Emery Sia was exceptionally good both in the pas de deux and in Giselle’s variation although perhaps tiring towards the end of the coda; and Stephanie Eunice Cabral – a taller dancer – was also first class. Their partners – respectively Elpidio Magat and Arnulfo Andrade – performed Albrecht’s variation with a measured degree of certainty in their jumps and landings, which suggested a cautious approach that only greater confidence can overcome, and both boys also need to gain experience in presenting their ballerina to the very best effect. Their Modern dance choices were strong, my favourite being the Arachnida duet created by Agnes Locsin ( I saw this performed by the senior dancers on the company’s tour to London a year ago), which is one long, tortuous series of lifts and holds with Joan Emery Sia’s “spider woman” being especially effective. These young dancers do the teaching staff of Ballet Manila great credit. Gaining international recognition through competitions is a big part of developing ballet in the Philippines and – by coincidence – Candice Adea of Ballet Philippines won gold at the Helsinki competition, on the very day of this gala. These much younger Ballet Manila dancers progressed to the semi-finals in Beijing and I believe that the company’s emphasis on rigorous training and prolific performance opportunities can only lead to many more competition successes ahead. The gala opened topically with a ballet about the environment, simply entitled Green, choreographed by US-based Filipina, Hazel Sabas-Gower, as a tribute to her mother, one of the pioneers of the “Green Movement” in the 1970s. This neo-classical ballet is opened and closed by Ballet Manila’s Principal dancer, Mylene Aggabao, an expressive and attractive dancer. She is joined by seven other dancers (4 girls and 3 boys) flowing through a series of group dances and three pivotal duets. It is a pretty piece, danced to familiar tunes by Bach, that provided an enjoyable curtain-raiser to the evening. Aleksandra Timofeeva and David Makhateli in Romeo and Juliet pdd. The first of the guest pieces was the Balcony pas de deux from Lavrovsky’s Romeo & Juliet, danced by Makhateli and Timofeeva. This pair recently performed Swan Lake together in the massive 6,000-seat theatre inside the Kremlin and they are clearly enjoying an evolving regular partnership (something Makhateli never really experienced at The Royal Ballet). Lavrovsky’s choreography is less spectacular (and less taxing) than that by MacMillan, but the pas de deux ends in powerful romantic imagery with the pair strongly lit in their parting embrace from a spotlight directly above. Timofeeva possesses a robust classical technique and a very good jump. Although I’ve seen this pas de deux too many times in recent months, it was a novelty for the Philippines and was very well received by an appreciative audience. ‘Sotto Voce’ is a work made on Ballet Manila (by Augustus Damian III) that shows off the strength of their ballerinas’ pointework to great effect. Set to Pachelbel’s ‘Canon in D major’, probably the most-played piece of classical music in elevators the world over, six girls take the stage – one by one – and remain en pointe throughout, providing a choreographic representation of the repetitive music of the canon. Yanti Marduli deserves credit for being the dancer on stage for the whole piece and a special mention also to Ballet Manila’s Australian dancer, Tiffany Chiang, who performed a long sequence of fast backwards pas de bourrée without a falter. This must be a draining and painful work to perform. The Mariinsky dancers were next up for a master class of Russian classical ballet – or, more precisely, George Balanchine’s neoclassical homage to the Imperial style – in the long Diamonds pas de deux, danced with effective adagio precision by Pavlenko and Ivanchenko. The slow elegance of the work gave an important balance to the gala but it seemed clear from a muted reaction that the Filipino audience had expected fireworks and not ice-cold jewels from these Mariinsky dancers. Daria Pavlenko and Yevgeny Ivanchenko in Diamonds pdd. The two extreme ends of Ballet Manila’s spectrum brought us to the interval. Beginning with a fun-filled, lively piece by company choreographer Gerardo Francisco for the scholars of Project Ballet Futures, entitled Limang Dipang Tao (Tagalong for A Crowd Five Bodies Deep) which describes an idealistic view of the hustle and bustle of the streets of Manila, complete with the compulsory Jeepney. It was a lovely touch to give these young dancers an opportunity to show what the gala was for and they responded by liberally infusing the event with the infectious spirit of Filipino dance. At the other end of the scale, the first act concluded with the grand pas de deux from Don Quixote, led by Lisa Macuja, the prima ballerina of the Philippines, who made little concession to the intensity of the choreography in deference to the fact that she is approaching her 48th Birthday. Ably supported by Rudy De Dios, Macuja sent the audience into the interval on a high as she rattled off the mandatory fouettés and multiple pirouettes with both brio and the innate sense of timing and musicality that comes with a quarter of a century’s experience performing as Kitri. Lisa Macuja and Rudy De Dios in Don Quixote pdd. If the first part of the bill focused heavily on the ballerina, the notable strength in depth of Ballet Manila’s male soloists was emphasised in the opening number of the second half. I doubt if there are many companies that can field 18 strong male dancers who can jump as high and in time as this outstanding group of Filipinos. Reconfigured by Augustus Damian III is designed specifically to showcase the intensity and power of Ballet Manila’s male cohort and they responded with remarkable speed, attack and athleticism. It was an impressive way to grab the audience’s attention after the interval and led into the pas de trois from Le Corsaire, with Gruzdev dancing the role of the Slave, Timofeeva as Medora and Nazer Salgado of Ballet Manila as Conrad. Although the Kremlin ballerina had danced with Gruzdev very briefly once before – substituting for an injured Fernanda Oliveira for just Act 4 of Swan Lake, last December – this was very much the scratch team and it did give a little at the seams. To be frank, I thought that the virtuosity of the Slave’s variation might be a stretch for Gruzdev (he told me that it was four years since he last attempted it) but what you lose on the roundabouts, you gain on the swings! And while his ménage of jetés en tournants and double tours was carefully measured, it was delivered with all the advantages of experience that gave a uniform flow accelerating into a very strong ending. Timofeeva danced Medora’s variation beautifully and I continue to warm towards this dancer the more I get to see her. The Moscow Kremlin Ballet stands in the shadow of the Bolshoi’s international reputation overseas but it attracts larger audiences when performing at home where Muscovites certainly know their ballet. Ironically, the leading Principals in the company have to be world class in order to satisfy the home fans. Paloma Herrera and Maxim Beloserkovsky in Apollo pdd. The programme came to a very strong conclusion with a preview of Paloma Herrera and Maxim Beloserkovsky performing the Apollo pas de deux, in which they were to make their debut together in the Met Season for ABT just a few days later. Beloserkovsky is well cast in the role of Apollo and gave a mature and expressive performance. If there were a global prize for the most gorgeous and pliable feet in the world of ballet then Herrera must be on anyone’s short list. They were followed onto the stage by the dynamic Cuban husband-and-wife pairing of Yoel Carreño and Yolanda Correa Frias (both now dancing as Principals in Oslo) who gave a special Cuban rendition of Vaganova’s Diana & Actaeon pas de deux, driving each other on to achieve greater height and faster spins. Carreño’s jumps in the variation and coda were a fusion of Vasiliev’s height and Acosta’s panache (throwing in the trademark flips of the working leg). The Filipino audience was worked up into a frenzy by this pair and I doubt if I have ever seen a more prolonged and louder bout of applause at a curtain call. The whole event was rounded off, as appropriate, by Lisa Macuja and the Ballet Manila dancers, thriving on the energy generated in the audience by the ABT and Cuban couples, in a colourful and creative piece of choreography made for the company by the late Tony Fabella (back in 1996) entitled Dancing to Verdi, which did exactly what it says on the tin. Lisa Macuja and Nazer Salgado in Dancing to Verdi. A 40-hour round trip to watch a ballet gala on the other side of the world might be seen as a trifle obsessive by some and perhaps it is. But galas tend to be two a penny these days and this one was certainly very different, both in terms of being in aid of a unique and wonderful cause – and I have seen at first hand how Project Ballet Futures literally changes lives – and in the spectacular diversity of remarkable dancing that showcased the best that both the West and the East have to offer.